Fleas and ticks are not just annoying to your dog; they can cause some serious health problems. We offer our top tips and advice for keeping your canine companion flea and tick free. Dog owners all over the world spend hundreds of dollars a year keeping their pet free of fleas and ticks, and with good reason. Fleas occur throughout the year and ticks are a pest right along the coastal areas, mostly during the warmer months. Flea bites are irritating, but this is the least of your dog’s concerns. The consequences of flea infestation can be a lot worse. If your canine is allergic to flea saliva, one bite is enough to trigger a severe itch. He’ll scratch and bite at himself until his skin is red and traumatised and he has lost the hair over the affected area. Bacteria can infect his broken skin which makes the itching worse, and years of biting the hair can wear down his incisors. The flea is the intermediate host for the tapeworm Dipylidium caninum. A flea infestation can result in a tapeworm infestation. Fortunately, these worms don’t cause anything more serious than an itchy bottom and weight loss. Because fleas drink your dog’s blood, a large number of them can cause anemia. In fact, dogs have died because of flea related blood loss. Ticks are a different story. The adult female paralysis tick (Ixodes holocyclus) injects a toxin as she feeds on your dog, which causes an ascending paralysis. Often the first indication of a problem is that his bark will change pitch, and he will seem a little wobbly on his back legs. The paralysis gradually moves forward to affect his forelegs and his breathing muscles. Tick paralysis can be fatal if not treated promptly. You’re not immune from the effects of these little parasites. Fleas will leave red itchy bites on your skin, but usually fleas have to be pretty desperate to bite humans. Ticks can also cause itchy lumps or allergic reactions in people, and can transmit some infectious diseases. Tick paralysis in humans is rare, but it does happen. There are a number of options available to dog owners to protect dogs from fleas and ticks. Shampoos, flea collars and powders don’t work well if you’re dealing with a lot of parasites. One of the most effective and fastest-acting flea control products is Comfortis, a flavoured tablet which keeps your dog flea-free for a whole month. The active ingredient in Comfortis is spinosad. If you’re looking for broad spectrum parasite protection, then Trifexis is a good choice. It contains spinosad for flea control, as well as other ingredients that kill heartworm and intestinal worms. If you want a combination product for ticks and fleas Frontline, Advantix, Bravecto or Nexgard are your best options. Bravecto is given once every 3 months, so combines well if you use the yearly heartworm injection from your vet, and a 3 monthly wormer like Milbemax. Nexgard, the monthly combine flea and tick chew, is even simpler. Combine it with the monthly heartwormer and intestinal wormer, Interceptor and you just need to remember to give both flavoured chews once monthly. A nice simple schedule to remember! Some dogs just will not take tablets and if your four legged family member falls into this category, then you’ll need a different product. Frontline and Advantix are both applied monthly if used for fleas, but need to be applied to the back of the neck every 2 weeks if used for paralysis ticks during warmer weather. Just avoid Advantix if you have cats. Frontline is also available as a spray but this is more time consuming to apply and can be messy. Some dogs don’t like being sprayed all over their body and will wriggle and try to escape. It can be a great, cheap option if you have multiple pets and species as it can be used in cats and dogs of all shapes and sizes. Fleas are prolific breeders so whatever method you choose to kill them, you need to also break their lifecycle. This is done with the use of insect growth regulators that prevents the immature life stages developing into adults. You’ll find these chemicals in someflea sprays or foggers. There are now a number of products available to kill ticks. They all cover fleas as well and can be grouped into collars, topspots and sprays, and flavoured chews. What you decide to use is based on convenience, cost and whether you also have a cat. There are a few collars available for ticks, we like the Scalibor collar, which is pretty cost effective and only needs to be replaced every 3 months. Just remove it for bathing and swimming. Topspots are placed on the back of the neck and there are two we recommend, Advantix and Frontline Plus. Both are used monthly over winter for fleas, then increased to fortnightly during paralysis tick season (but for other types of ticks, such as cattle ticks, they can be used monthly). If you have cats, the only product safe to use (particularly if your cat and dog share resting areas) is Frontline. You can also use Frontline spray every 3 weeks for paralysis ticks, and this is the only product suitable to put on a cat for tick control. There are now two new brilliant tick control options available that we absolutely love for their convenience. Bravecto is given orally every 3 months and comes in a flavoured chew. Nexgard is monthly, so combines well with Interceptor. Whatever method of tick control you use, it’s important that you check your dogs for ticks every day during tick season. Run your fingers through his coat while you’re cuddling him, and feel him all over when you’re bathing him. The female tick only starts to inject her toxin into your dog after she has been attached for at least 24 hours (but often several days), so if you can remove the tick before this time has elapsed, your dog won’t become paralysed. For more on ticks, including how to remove a tick visit here. Sometimes, in spite of your best efforts, you find your dog has picked up a heavy flea burden or a tick. That’s okay, you can get rid of them and if you’re quick, he won’t suffer any ill effects. All the fleas on your dog can be killed instantly by giving him a Capstar tablet. You’ll see the dead fleas on the floor within 30 minutes! At the same time, vacuum your carpet, wash his bedding and use a fogger or insecticidal spray in your home. When all the fleas are gone, don’t be complacent – start a good flea prevention program straight away so your dog doesn’t end up in the same situation again. If you find a tick on your dog, remove it immediately. There are tick removal tools available but it’s just as easy to use tweezers. Grasp the tick as close to your dog’s skin as possible, twist to release the mouthparts of the tick, then gently pull. Don’t worry if you think there is still some tick under the skin. You will often see a very inflamed area called a ‘tick crater’ for a week after removing the tick. It is always recommended that you visit your vet even after removing the tick, since the toxin already inside your dog keeps working for 24 hours even after the tick is removed. This means your dog can still get sick and may need treatment. If you can take the tick with you for identification your vet can confirm whether it is a paralysis tick or not. The colour of a tick’s body will vary with the age of the tick, but the leg colour is a consistent way to identify the tick. 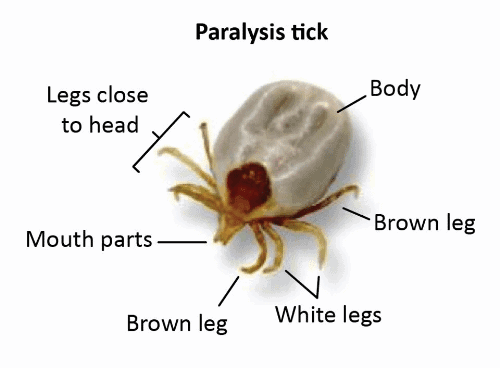 The paralysis tick is pictured below and has brown legs at the front and back, but white legs in the middle (though it can be hard to see the colour difference). Paralysis tick, showing leg colours. When you’re dealing with fleas and ticks, you need to keep them under control by regularly checking your dog’s skin and using an effective insecticide. By doing so, you’ll avoid skin irritation and infections and even worse, life threatening paralysis. When it comes to these little parasites, prevention is definitely better than cure. The post Flea and Tick Control for Dogs appeared first on VetBabble.